My first crock pot recipe! I swear I'm 21 going on 41. The thing is, crock pots are magical and so easy to prepare an amazing meal ready for you after a busy day full of classes. Monday was actually a beautiful day in Oklahoma, but I made this Verde Turkey Chili for my roommates and I to warm up with before the "polar vortex" swooped in on Tuesday. It warmed us up and hit the spot. Best part is, it was incredibly simple to make. Only six ingredients are used and they all get dumped in the crock pot. Take a chill pill this weekend, relax, kick off our shoes, whatever--just make this chili! Cook your turkey meat in a non-stick pan. Once your turkey is cooked, strain it. Next, strain your beans. Now begins the "dump" method. Dump the turkey, dump the beans, dump the salsa, and dump the frozen peppers and onions all into the crock pot. Season with cumin and chili powder then lightly stir together in the crock pot. Set your pot to high and cook 4-6 hours or low and cook 6-8 hours. 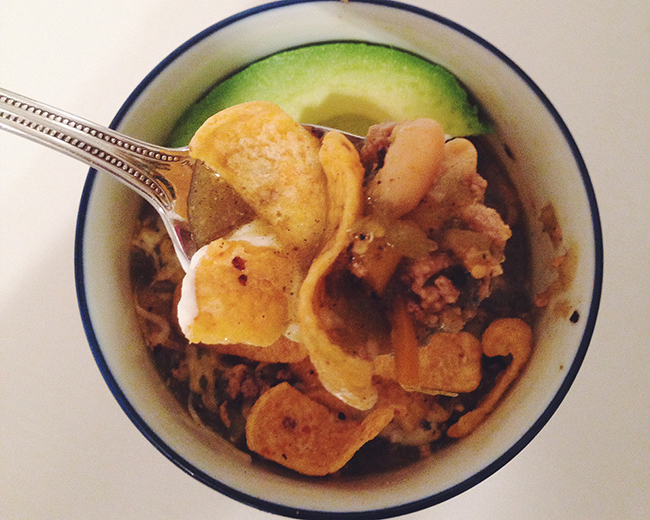 Serve with lots of Fritos, plantain chips (if whole 30), sliced avocado, shredded cheese, a dollop of plain greek yogurt, and maybe some more Fritos:) I'm a Frito connoisseur when it comes to chili. Fritos and chili go together like apples and almond butter in my book! P.S. it's even better the next day!